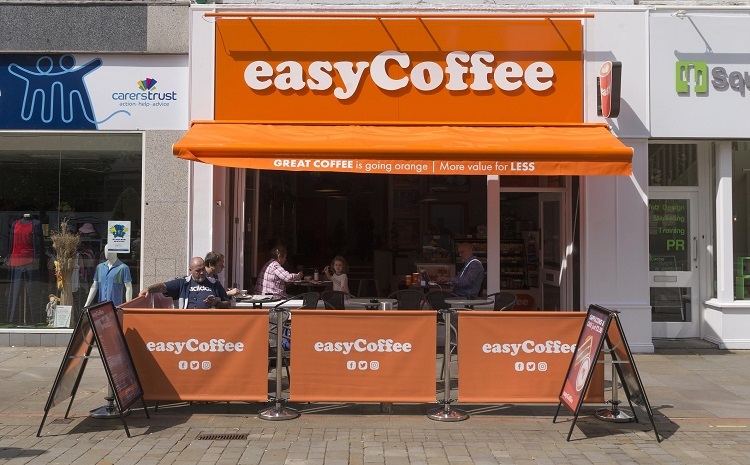 Despite the challenges of slowdown, lower profits and market saturisation faced by many coffee shops, easyCoffee is rapidly growing and seeking new funding of up to £3 million to expand its business. Part of the easyGroup family of brands that includes easyJet, easyCoffee offers fantastic value beans-to-cup quality fairtrade coffee at its eight coffee stores and soon-to-be 250 vending machines nationally. It has commitments to open 100 more stores in the next three years. Recent market analysis shows that there was a net increase of only 25 coffee shops opened by major coffee shop chains in the UK last year*. In contrast to other market leading coffee shop chains, which are focused on the premium product offerings, easyCoffee’s strategy is to target the less developed value segment of the coffee shop and coffee to-go market, by providing quality coffee at affordable price points. Bucking the trend of negative news stories about the coffee sector – which analysts argue is facing saturation point in four years’ time** – easyCoffee has already secured substantial angel funding plus a significant sum from a Middle-Eastern investor. It is now looking to complete second-stage capital raising of up to £3 million to bolster its continued growth in the coffee shop and vending sectors. Combined with sister brands easyHotel and easyGym tie-ups, easyCoffee has also partnered with Thorntons to provide a luxury hot chocolate drink at its coffee stores. Its vending machines are located in well-known retail outlets across the UK, from large DIY stores to convenience shops and petrol stations. easyCoffee’s plans for expansion involve opening another 200 owned or franchised coffee shops in the next three years. It has already secured development partnerships with seven franchisees that have committed to delivering 50% of these. Its vending business of soon-to-be 250 machines is already proving itself a success, with above-average sales take-up nationally, and the brand expects to roll out a further 500-700 vending units this year. Vendors are attracted by the high visibility of the ‘easy’ brand and the support it can offer. For example, by the providing the latest digital technology to allow them to connect to their customers using a unique loyalty app, bespoke promotions and interactive messaging communications designed by easyCoffee.